Today will see a full moon and a total lunar eclipse (best seen from the Pacific and neighbouring regions). A previous post looked at the relationship between the lunar calendar and the stock market. The below updates the chart that appeared in that previous post. 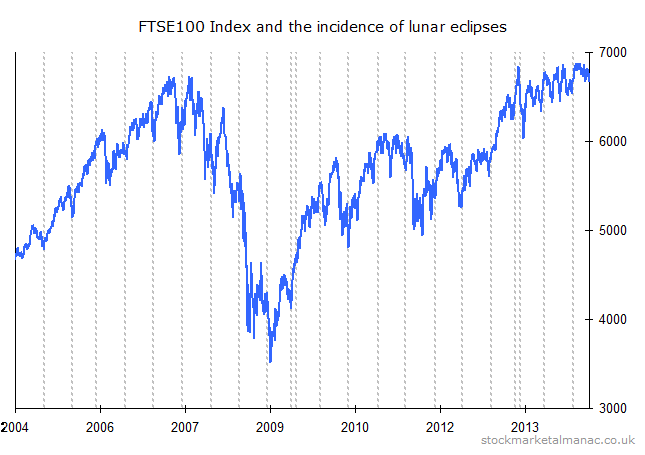 25 May 2013 – the timing of the eclipse coincided with the high point of the year for the FTSE 100; in the four weeks following the eclipse the index fell 10%. 18 Oct 2013 – the eclipse occurred in the middle of an upswing. 14 Apr 2014 – the eclipse marked the bottom of a short down trend; the market rose 5% in the following four weeks. Do the phases of the moon affect the stock market? One half of the moon is always illuminated by the sun; but its visibility from the earth varies from zero (“new moon”) to 100% (“full moon”). The time between new moons is approximately 29.5 days. Lunar calendars are based on the phases of the moon. Most lunar calendars that are used today (e.g. the Chinese calendar, Hebrew calendar and Hindu calendar) are in fact lunisolar, so called as they try to reconcile a lunar calendar with the solar year. The only widely used calendar that is purely lunar is the Islamic calendar. In folklore (and sometimes scientific studies) full moons have been said to affect human behaviour. Of course, it is ridiculous to ask, but can full moons affect the behaviour of investors and thereby influence the stock market? The table below shows the result of some analysis into this (on FTSE100 daily data since January 2000). All days refers to all market days since Jan 2000. FM(0) refers to the day of the full moon itself and the other columns to the one and two days before and after the full moon. 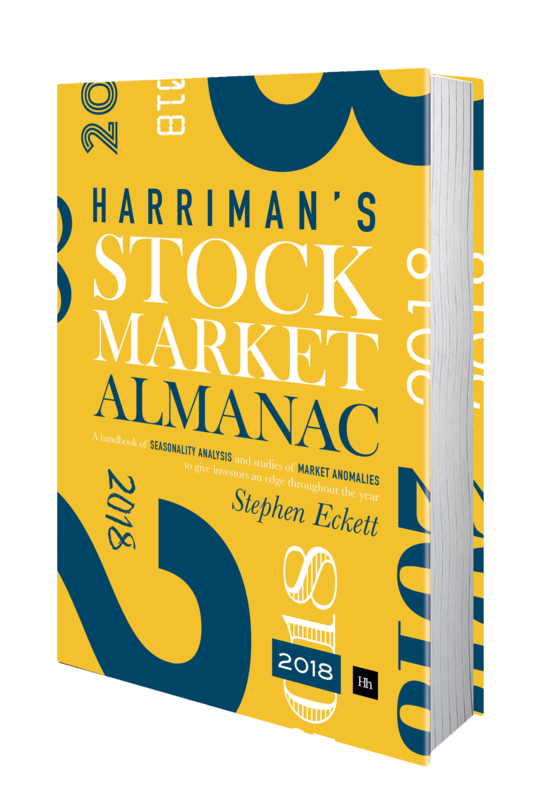 It was found that on days with a full moon the FTSE 100 Index rose on average 0.09% (25 times the average increase of 0.004% for all days). The market had a tendency to rise the day after a full moon as well. By contrast, two days before and after a full moon the market tended to be weak. Lunar eclipses occur when the earth passes between the sun and the moon – they can only happen at full moons. 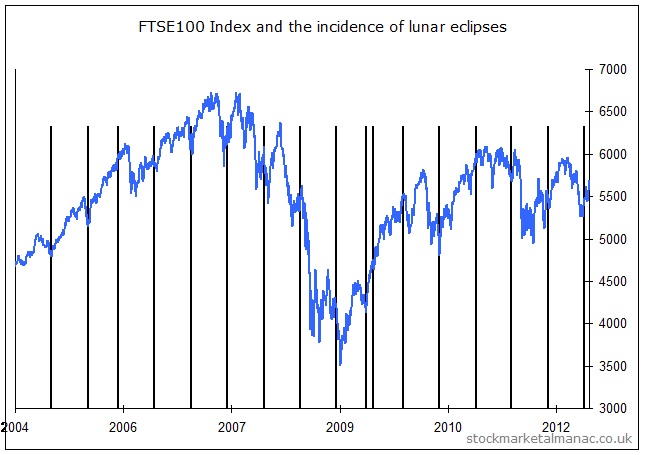 The chart below shows the FTSE100 Index since 2004 and the incidence of lunar eclipses (the vertical bars). A quick look at the above chart shows that there is no close correlation between lunar eclipses and the behaviour of the stock market. However…if one was so minded, one can see some correlation on occasions. Occasionally the eclipses do accompany strong moves in the market, including significant turning points. An interesting time can be when two eclipses unusually occur in consecutive months (this happened in July 2009 when the market rose 12% in 22 days between the two eclipses). No doubt a coincidence.